Drizzle the steaks on both sides with about 2 tablespoons of the olive oil and coat with the seasoning mix. Grill for about 4- 6 minutes. Turn the steak over and grill for about 3 minutes or until an internal temperature of 140 to 145°F is reached for medium-rare. Heat a large non-stick skillet, cast iron pan or griddle over high heat. Cook the meat for 5 minutes on each side for medium-rare. When done, remove steaks to a plate and allow to rest for 3 minutes. Over medium heat, add 1 tablespoon olive oil plus 1 tablespoon butter to a skillet. When melted add the shallots and the garlic and cook for 2 minutes. Add the wine and cook and stir for about 1 minute. Add the remaining tablespoon of butter and cook and stir until sauce is slightly thickened. This versatile grilled steak recipe can be prepared with your favorite citrus such as lemon, lime or orange and your favorite dried herb such as thyme, parsley, savory, oregano or sage. In small bowl, combine ingredients and press into both sides of steaks. Grill 16 to 18 minutes for medium rare, turning occasionally. Carve steaks crosswise into thick slices; season with salt, as desired. Set up your grill for direct grilling and preheat to high. Toss the mesquite chips on the coals or put them in your grill’s smoker box. Season the steaks generously on both sides with the rub. Grill for about 4- 6 minutes. Turn the steak over and grill for about 3 minutes or until an internal temperature of 140 to 145°F is reached for medium-rare. Meanwhile, heat the olive oil almost to smoking in frying pan. Add the jalapenos, garlic, and cilantro and cook until fragrant and just beginning to brown, 2 minutes. Spoon this mixture over the steaks and serve at once. Make barbecue sauce: Heat oil in medium saucepan over medium high heat. Add onion and cook until translucent, 3 to 5 minutes. Add remaining sauce ingredients and bring to a boil, stirring. Reduce heat to low and simmer, partially covered, 20-25 minutes or until thickened. Stir occasionally. Prepare grill. 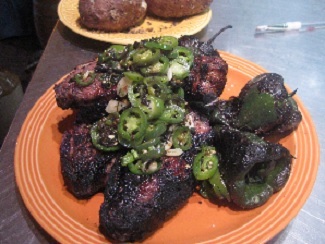 Combine chili powder, paprika, salt, sugar and black and red peppers. Rub spice mixture all over steak. Let steak marinade in spice rub at room temperature for one hour. Grill about 6 minutes per side or until an internal temperature of 140 to 145°F is reached for medium-rare. Brush entire steak with 1/2 cup barbecue sauce. Cook 1 to 2 minutes per side. In the oven: Place steak in a broiler pan and position in broiler 3-4 inches from the flame. Broil 5-8 minutes per side until browned but medium rare in the center. Let stand 10 minutes before slicing. Serve with remaining sauce. Place the steak in a plastic Ziploc bag. Combine the marinade ingredients and pour in the bag with the steak. Seal bag and refrigerate at least 2 hours or overnight. Discard marinade when done. Grill beef over medium-high heat for 5 minutes on each side or until desired doneness. Baste steak with olive oil as it cooks. Brush oil onto a piece of foil and grill the onions on the foil until tender. Combine all ingredients and stir until well blended. Serve chilled. Scrub off dirt from mushrooms and slice into quarters or halves depending on size. Mince the shallot and garlic and set aside. Heat a heavy pot, add oil or butter along with mushrooms. Cook until mushrooms release their liquid, about 5 minutes. Add shallots and garlic and continue to cook until mushrooms are tender. Add brandy and deglaze pan, scraping up any bits stuck to it. Continue to cook until brandy is evaporated, about a minute. Season with salt and pepper, garnish with parsley, and serve immediately.